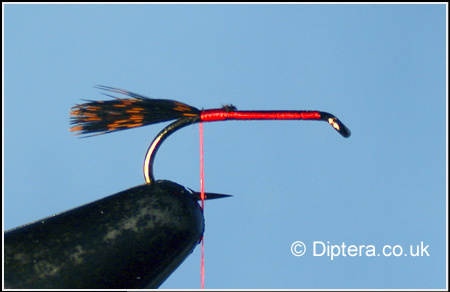 STEP 1 : Run the tying thread down the hook shank, catching in a bunch of grouse hackle fibres. Stop the thread at a position opposite the barb. 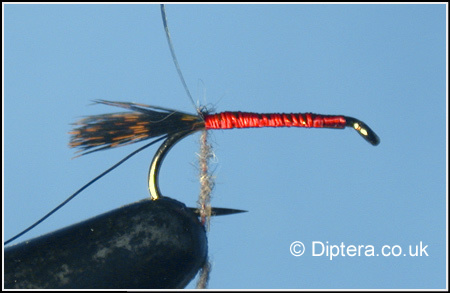 STEP 2 : Now catch in some gold wire to the underside of the hook and a length of pearl mylar tinsel to the topside of the hook (This will become the cover for the body when pulled flat). 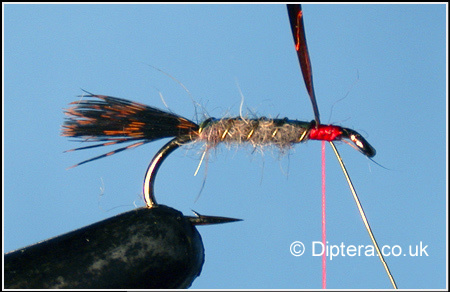 STEP 3 : Dub some hare's ear fur onto the tying thread. 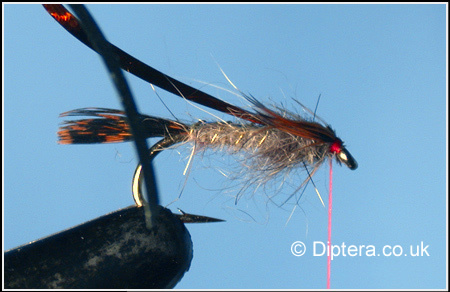 STEP 4 : Wind the dubbed hare's ear fur up the hook shank, stopping just over 1/3 of the hook shank length from the eye. STEP 6 : Now create a dubbing loop with thread, place some hare's ear fur in between the loop, spin the thread with a dubbing twister. (There are many methods for creating a dubbing loop. Here's a link to create a basic dubbing loop) . 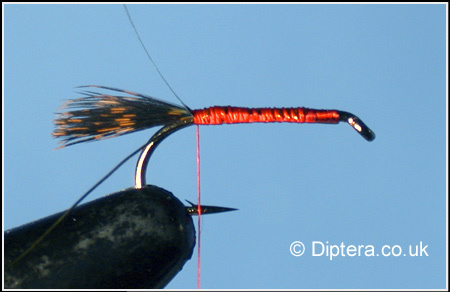 Wind the dubbed loop around the hook to create a bushy thorax. 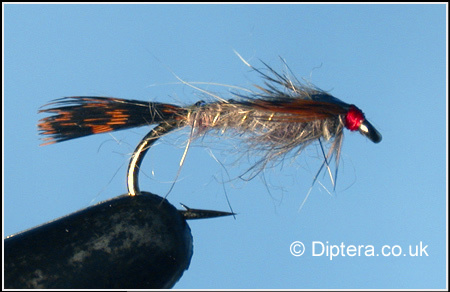 Tie off at the eye and trim waste Pick out the hares ear fibres on both the body and thorax with a dubbing teaser. 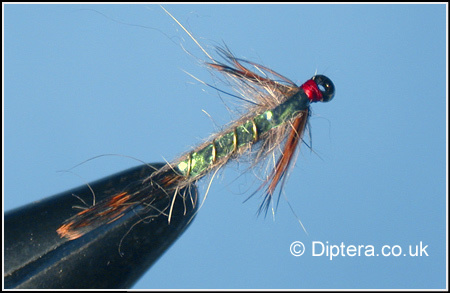 STEP 7 : Now catch in a bunch of grouse fibres at either side of the thorax. Final : Now pull the remaining pearl mylar forward, make sure no grouse fibres get trapped and tie in at the eye. Trim any waste, create a neat head, whip finish, cut away thread and varnish. 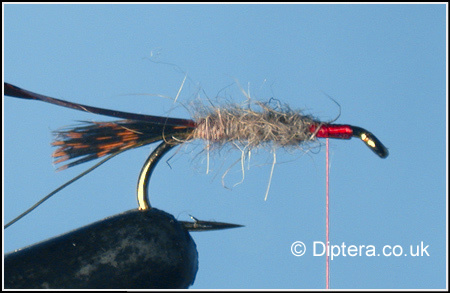 Front View : This is how the grouse fibres should look at either side of the fly, giving it that extra bit of movement through the water. 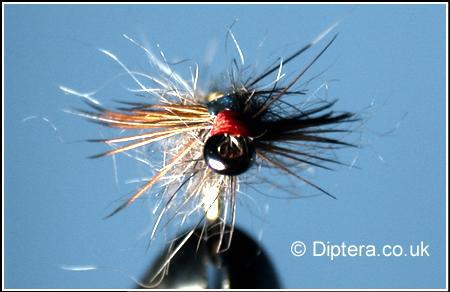 Plan View : This how the fly looks from above.